Diagnostic tests are sometimes necessary to identify the underlying cause of your pet's illness when a thorough physical examination doesn't paint the whole picture. As part of our commitment to provide you with access to the best medical care for pets in the Indian Harbour Beach area, Aloha Pet & Bird Hospital has invested in the latest diagnostic technology, which we use to help assess the source of any health issues your pet may encounter. Before any recommended tests are performed, our veterinarians will review all the available treatment options and fees with you. Computed tomography, or CT, creates high-resolution 3D images of your pet. 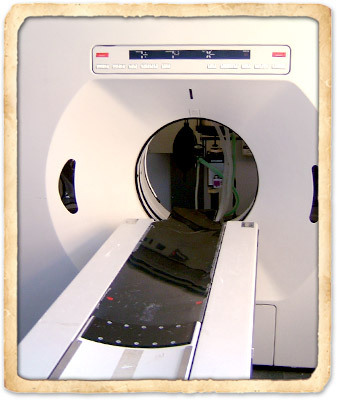 CT is one of the best diagnostic imaging tools available and we are very excited to offer the service to our patients. The results are especially useful for detecting small masses and fully assessing damage in trauma situations, both of which may not be visible on conventional radiographs or ultrasound. The CT scanner is a ring-shaped apparatus that rotates around your pet. With CT imaging, the computer builds a 3D image of your pet and the entire image can then be manipulated in different ways, allowing for a truly comprehensive examination of all internal body structures. By administering a specialized dye, CT scanning with fluoroscopy produces a continuous X-ray that produces a real-time moving image of the dye through parts of your pet's body, such as blood vessels or the digestive tract. The detailed images a CT scanner produces help us achieve the best and quickest diagnosis possible and greatly enhance the level of service and quality of treatment we can provide to your pet. It is also one of the many ways we work to fulfill our commitment to you to protect your companion's health so both of you can enjoy the longest, happiest life possible together. Endoscopy is a minimally invasive diagnostic procedure commonly used to evaluate the interior surfaces of your pet's organs through a small tube inserted into his or her body. An endoscopic examination produces a full-color, magnified view of the area of interest and can often accurately diagnose what is causing your pet's vomiting, diarrhea, weight loss, abdominal pain or swelling, loss of appetite or respiratory problems. It can also be used to collect biopsy samples and remove foreign objects, small polyps or tumors. Although anesthesia is required to keep pets still during the endoscopic procedure, the recovery time is minimal. The benefits of endoscopy over exploratory surgery include no surgical incision, shortened anesthetic time, decreased inflammation, less stress and discomfort and an earlier return to normal function for your pet. 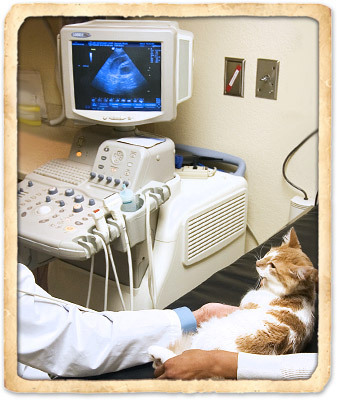 Ultrasound is a painless, safe, non-invasive procedure we use to evaluate your pet's internal organs. It is one of the many ways we strive to give you peace of mind when it comes to your pet's health. Using sound waves, ultrasound produces a real-time moving picture of your pet's organs that allows us to visualize objects that cannot be detected by X-rays alone. At Aloha Pet & Bird Hospital our veterinary team uses ultrasounds to assess the shape, size, tissue density, internal structure, and position of your pet's abdominal organs, assess cardiac health (also called an echocardiogram), and diagnose pregnancy. It can also be used to identify cancerous masses or tumors. The ultrasound procedure takes between 30 to 60 minutes to perform and, unless it is being used during a surgical biopsy, does not typically require sedation. A diagnosis based on what we see is usually available immediately, which means we can also provide you with treatment options at the time of your appointment, minimizing your worry and stress. Radiographs, or X-rays, are one of the most common, useful diagnostic tools in medicine. 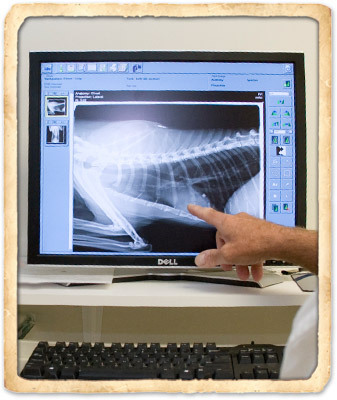 At Aloha Pet & Bird Hospital, we use X-rays to examine your pet's bones, lungs, heart, abdomen, oral cavity and other areas and for diagnosing and monitoring many medical and surgical conditions. If we suspect your pet has a fractured bone, has swallowed a foreign object, or is suffering from a heart problem, an X-ray can tell us what we need to know. Advanced diagnostic capabilities are an extremely important part of veterinary medicine, in part because we can't simply ask our patients what is wrong. Our investment in digital X-ray technology and the skilled professionals needed to accurately interpret them reflects our commitment to offer you and your pet the best, most comprehensive healthcare available. When performing routine wellness examinations or diagnosing an illness, what our veterinarians can't see is as important, if not more important, than what they can. Because protecting your pet's health is our most important job, we have a complete in-house diagnostic laboratory that allows us to perform a wide range of tests on blood, urine, feces, and biopsied tissue. Without timely access to these precise test results, it would be difficult to accurately assess your pet's health. Test results can also help us in the early detection of diseases and other conditions affecting your pet's health and well-being. For example, diagnostic testing can detect heartworm disease, Lyme disease, infections, feline leukemia, intestinal parasites, urinary tract infections, and many additional diseases and conditions that can go unnoticed in their early stages. Blood testing can show early evidence of diabetes, changes in liver or kidney function, or simply provide a baseline for future reference. 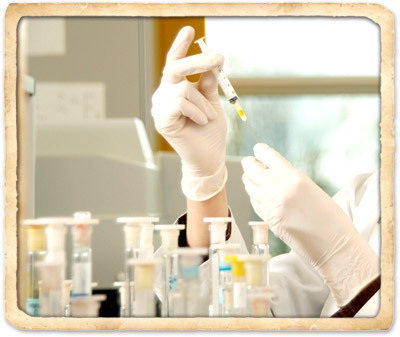 Diagnostic laboratory testing is also completed prior to dental or surgical procedures that require general anesthesia. Laboratory testing provides information about your pet's systemic health without the need for invasive, expensive procedures. Thanks to our in-house diagnostic laboratory, we can deliver your pet's test results quickly – often within a few minutes – minimizing the time you need to wait for an accurate diagnosis and treatment plan.